Today I'm bringing you a lovely nail post. I recently purchased 10 nail wheels and I've been eager to use them. These are my favourite nail colours for this summer! 1. Beauty UK nail polish salon professional varnish in 63 Turquoise shimmer. This colour is a slightly shimmery pretty green. The more you paint over it the darker it will get, meaning you can use it as a light green or a deep green, so it's pretty buildable. 2. La Femme Beauty varnish. Sadly the wrapper on this has faded an awful lot so I don't really know what shade or brand this is, but I've tried to attempt to read it. It's a pinky orangy peachy colour and is rather bright. 3. Beauty UK nail polish salon professional varnish in 51 Coral. I'm a huge fan of red nail polishes, I love how where I'm quite pale the red really goes with my skin colour. This, like the green, is buildable too, but it's pretty much a block colour. These nail varnishes last for days without chipping and they're such pretty colours. 4. Another Beauty UK nail polish professional varnish in 84 Girl Gone Wild. 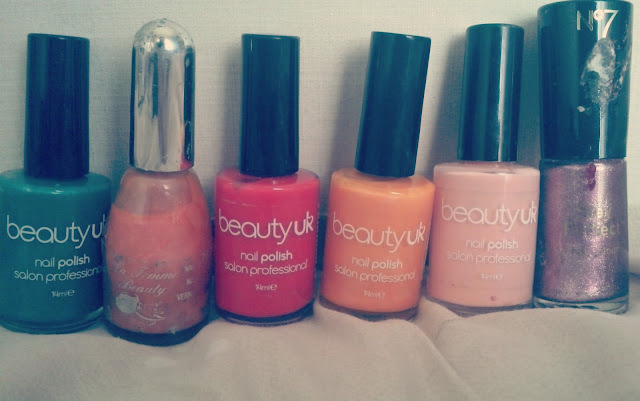 As you can tell I own a lot of these Beauty UK nail polish's, they are my absolutely favourites. This ones a beautiful orange colour. It could be mistaken to be slightly yellow in some lights, and it's rather bright, so it's probably not best if you're really pale like me. 5. My last Beauty UK nail polish professional varnish for today, this one in 72 Peach Melba. This one, as in the name, is a gorgeous peach to pink colour. It's very light no matter how many times you try to paint over it, but it's a lovely colour for the summer. 6. Lastly this one is a No7 Stay Perfect Nail Colour, sadly it doesn't say a shade. It's literally just a purple varnish with glitter on it. This is nice for when you go out in the summer more than on a day to day basis. This is my first nail post as the last one I did a few months ago was a guest postI hope you enjoyed this, I might do some more nail posts in the near future if I can.